2014 saw London’s 10 year old Kemistry Gallery announce that it could no longer stay at its existing location in Shoreditch due to rising rents. After a successful Kickstarter campaign, Kemistry have just released details of a new pop-up exhibition to celebrate their first 10 years. 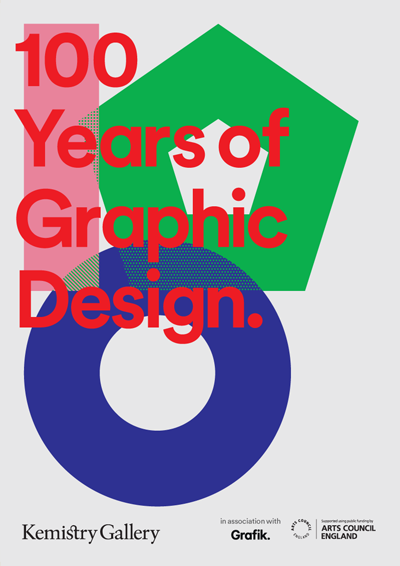 100 Years of Graphic Design will feature work from every designer and illustrator that they hosted an exhibition for in their 10 year existence, a list of design luminaries that stretches back 100 years. The Kickstarter campaign raised £16000, and was further supported by an Arts Council grant of £15000. This money is being used to put on this celebration as well as host future pop-up exhibitions, publications and activities to support the UK’s graphic design community, and secure Kemistry Gallery’s long-term future. Excitingly, they state on their website that not only do they want to find a permanent space, but wish to transform it into a ‘National Centre for Graphic Design’. The show will run from 7–15 March at Protein Studios, 31 New Inn Yard, London EC2A 3EY. Find out more details from the Kemistry Gallery website here.